Chapter 7 should be up in a day or two and I've started on chapter 8 -roughly 4 pages so far. I'm hoping to wrap it up soon so you guys won't have to wait long for each new chapter. Okay, that aside, I just came back from a 2.4km run and I clocked 20 minutes! OMG. Lol. That's actually amazing considering that I haven't ran for like uh, 2-3 years? Ah now, my legs are shaking! Ahahaha. Oh yeah, I wanted to share this picture I found online [if this is yours, let me know i'll put the link]. 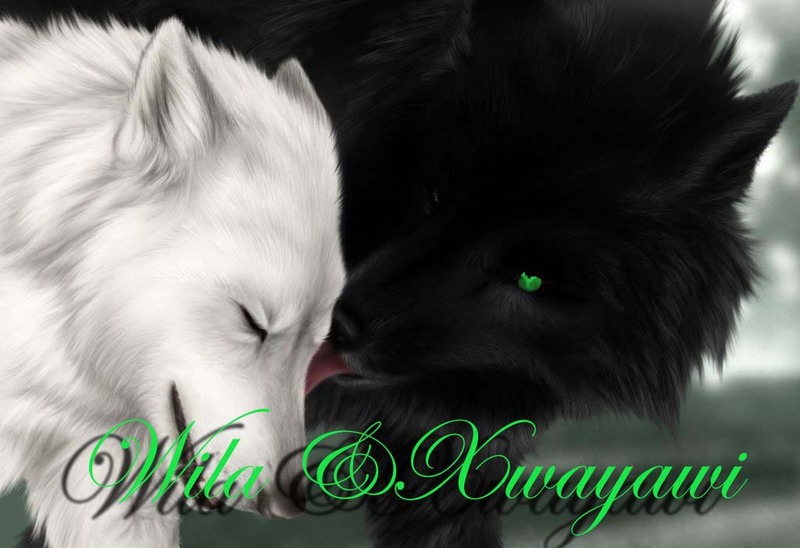 But it reminded me of what Alex would look like with Keona if she was in wolf form. So sweet. =) I always find the wolf-mate thing a very interesting phenomenon because unlike other animals, wolves tend to form such long-lasting bonds. Although it's debatable whether the mate thing is only applicable to the Alpha pair or to all but for fictional sake, we'll take it for all.